Google really improved the virtual assistant that helps you find things and they actually are giving it a “personality” which is pretty cool. That’s how I found this recipe here from my friends who do the blog The Minimalist Baker. I already have their cookbook and it’s outstanding. I’m amazed at the wide array of delicious dishes that the authors come up with making it vegetarian and also gluten-free, which could be quite limiting. I had some very ripe bananas that needed to be used and I bought a big thing of Blue Diamond almond flour that I want to experiment with and make more dishes with- and this recipe was the answer to using both. I hope you enjoy it too. Even if you’re not vegetarian or vegan or have a gluten-free diet you’ll probably like them anyway. The great thing about these is there lower in sugar than most and lower in fat and healthier….and great! The bottoms of my muffins were kind of soggy and so I bake them an additional 5 minutes, and they came out much better. Gluten-free baking is so if he and I don’t think I’ll ever get used to the texture of baked items that are gluten free. The only one that I’ve liked so far as the things that are made with a mix from Pamela’s gluten-free mixes, which come out very well all things considered. Recipe and photos coming soon. 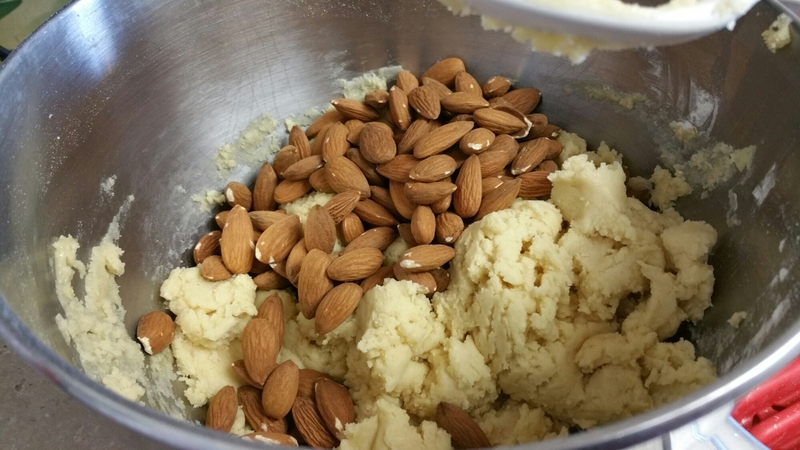 Additional nuts or rolled oats to top muffins with. mix flax eggs with recommended amount of water and let sit a few minutes. Add bananas and mash. I put mine in my KitchenAid mixer with a paddle attachment and it automatically mashes up the banana for me. Add agave syrup and remaining ingredients and then bake for 25 to 34 minutes, until a toothpick in the center comes out clean. Store in an airtight container or freeze for longer storage. One cup low sugar dried cranberries-added last after the granola is baked. Mix all ingredients together except for the dried cranberries. The one I used was the lower sugar version that Ocean Spray makes. What I loved about this recipe is that it uses very little oil -only one teaspoon. Cut 2 pieces of parchment to fit in the air fryer oven. Take to the shelves out of the air fryer oven and put the parts bin on top. Way down on the parchment with something that’s heavy so you can scoop on the granola with a stainless steel ice cream scoop. That makes it a lot easier so you don’t make quite a mess by doing it that way. Lower the temperature on the device to 220 degrees and bake for 40 minutes. I then baked it an additional 10 minutes at 220 degrees. What the granola sit on the counter on the parchment cooling for about 10 to 15 minutes. Once cool then add the dried cranberries and stuff early. Store in an airtight mason jar or another airtight container and you can put this on yogurt or top a healthier open face apple pie with it. Recipe adapted by Paulette Motzko from Almond Granola and the power air fryer oven dehydrated Creations cookbook. Pictured here are my Mocha Spumoni Biscotti and Almond Biscotti. 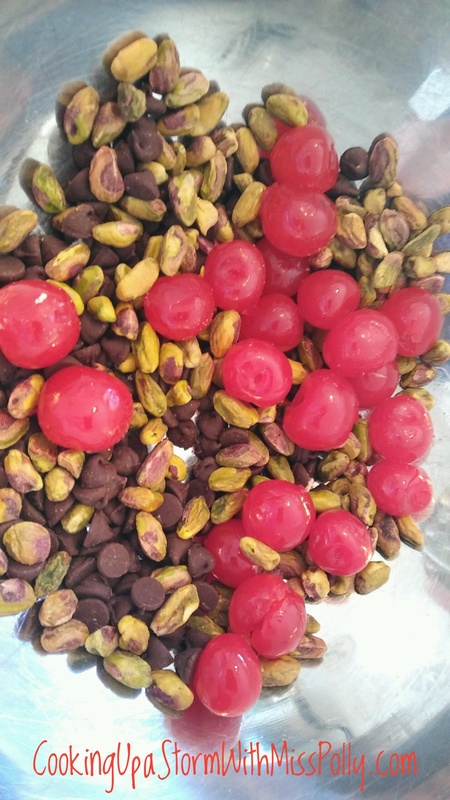 Some of the wonderful flavor ingredients in the biscotti are pistachios, Maraschino cherries semisweet chocolate chips. One tablespoon instant coffee Dasher I used Nescafe brand because it blends really well in liquid. Mix all ingredients in a large bowl with a very very sturdy long spatula or a wooden spoon. 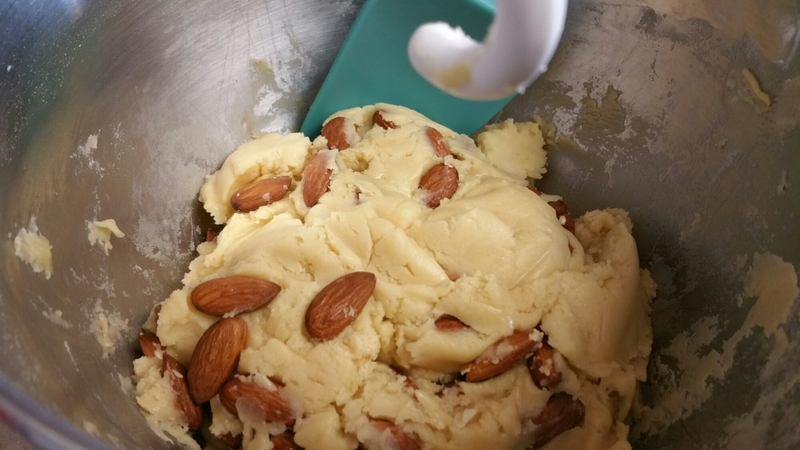 I prefer my KitchenAid mixer with all the work for me and it breaks down the nuts and the fruits in the smaller bits while the dough hook kneads it. It does lots of things all at once really efficient. The smaller you break down your ingredients in the biscotti the easier it will be to cut with a very sharp knife without making your biscotti crumble. 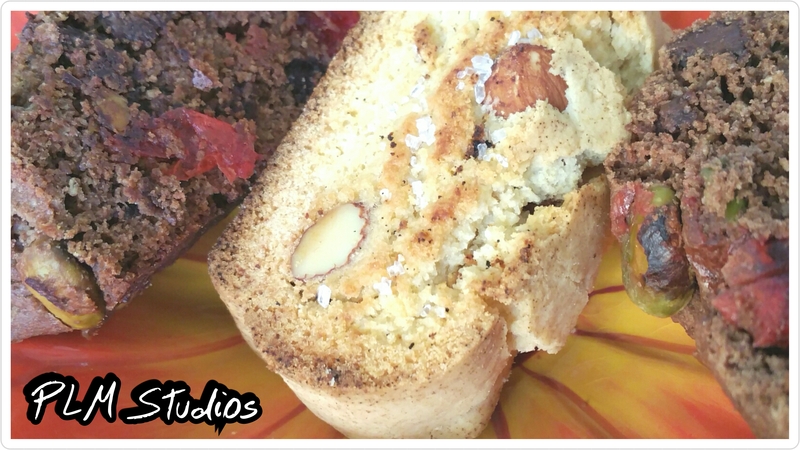 The biscotti dough will look something like the above picture. 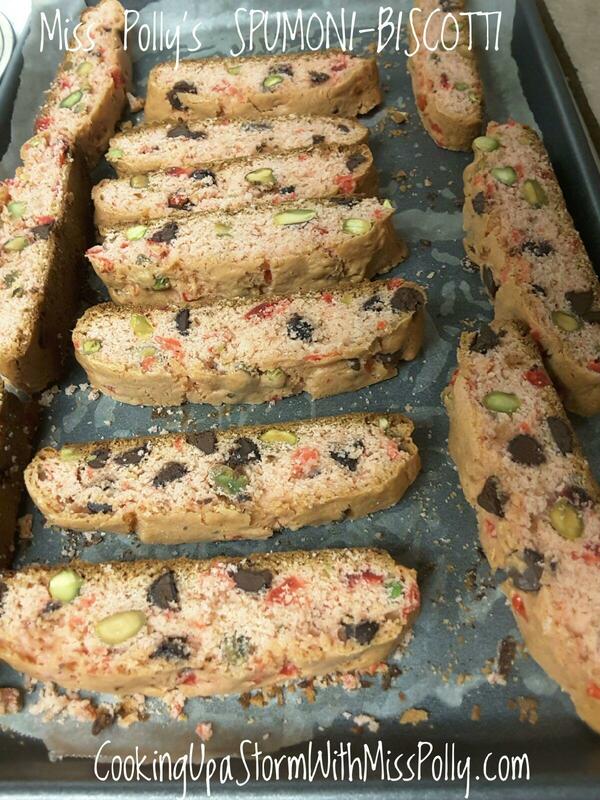 This is what the Spumoni biscotti look like without the cocoa and the coffee flavors added. 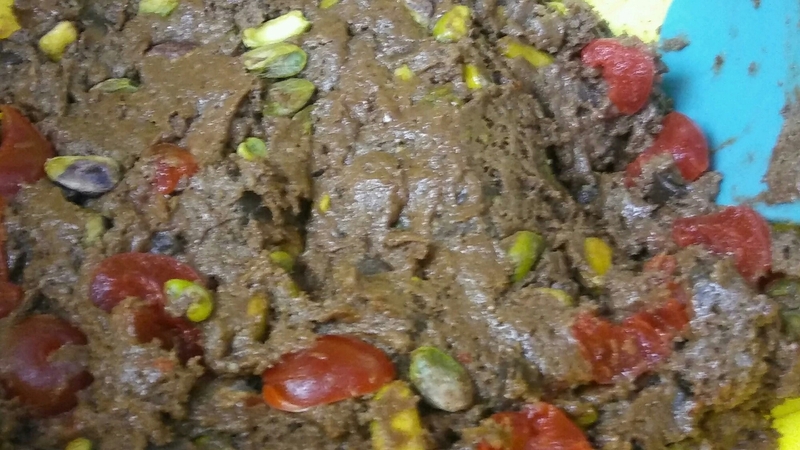 When’s the dough is formed into a nice uniform bowling all the nuts fruit and chocolate our backs into the biscotti dough, then form into two logs the same size and width. Bake the 350 degree oven for 20 to 25 minutes or until crack and deep brown around the edges. Cool on the cookie sheet 10 minutes or more. Natural logs and cool, and cut with a very sharp knife in thin slices. Very carefully turn the slices down on the sheet, and bake an additional three to five minutes on each side. Cool completely and store in an airtight container, and enjoy enjoy with coffee or tea and Delight your guests and friends. 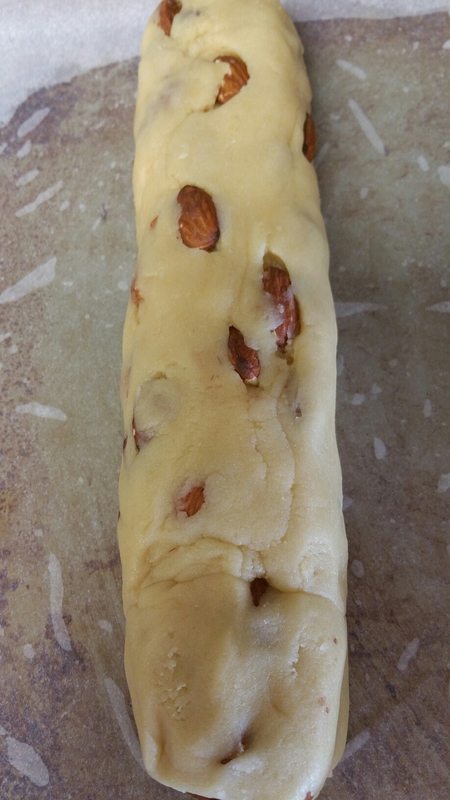 switch to the dough hook and add in the almonds. Form into two long logs on a parchment-lined baking sheet. Bake 20 minutes at 375 degrees, or until golden brown. Cool for about 10 minutes and slice on the diagonal into 1/2 inch slices. Place the slices cut side up onto the baking sheet, and bake for an additional 5 minutes on each side. 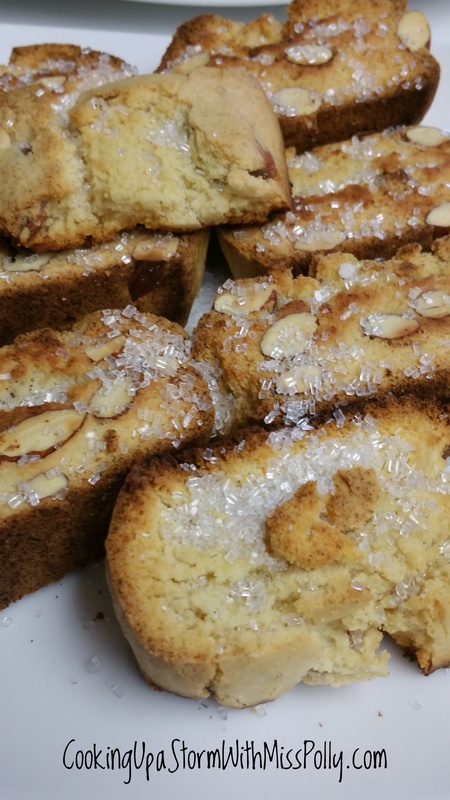 Recipe adapted by Paulette Motzko from Almond Biscotti by Fisher Almonds. January 24th 2017 at 2:32 p.m.; 3:45 p.m.